The Scotts with Jr.’s first steelie taken with a centerpin. Last winter Oswego County lived up to its reputation as one of the snowiest places in the country. Indeed, even after the recent thaws, you can still find several feet of snow in remote spots on the Tug Hill Plateau. Fortunately, most of the white stuff has liquefied and poured down the face of the hill, fattening up the skinny creeks, swelling them to ideal steelhead spawning habitat. And the fish are stormin’ in from Lake “O” in unbelievable numbers. 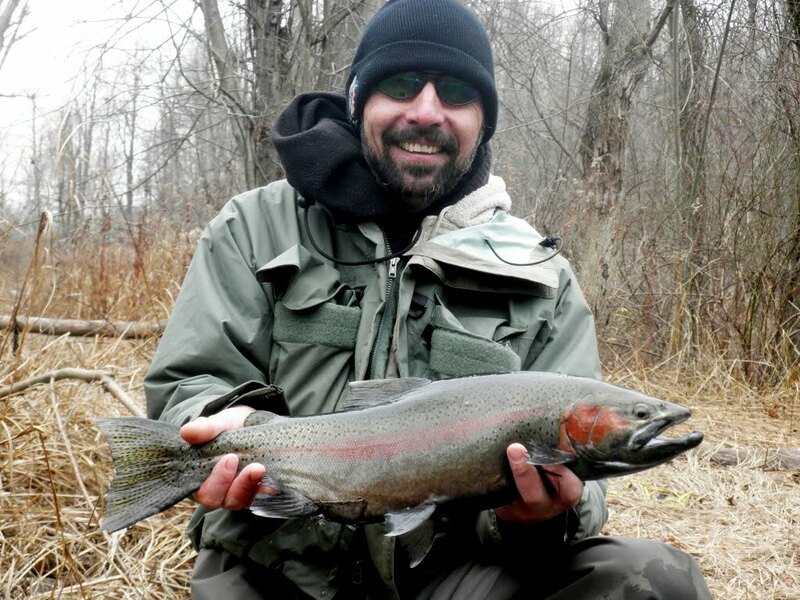 Scott VanDerWater, a Baldwinsville native who spends more time up here this time of year than he does at home, has been nailing massive quantities in Trout and Orwell Brooks , tributaries to the Salmon River, for over a week. “Trout Brook was loaded with ‘em in the beginning of last week,” adds VanDerWater. “Then the thaw late in the week tripled the volume of water, making it all but impossible to fish. This week the water’s down to optimum levels again and the fish are everywhere. “The fishin’s been so good, I took my seven-year-old, Scotty, and he nailed one, his first on a centerpin,” boasts the proud elder. South Sandy and Grindstone Creeks are also enjoying good runs of chrome. A couple days ago, there was still an impassible snow drift across the Selkirk State Park Road leading to the mouth of Grindstone, but it should be melted by the end of this week. Most fish are being taken by guys float-fishing with all the usual suspects: egg sacs, Berkley Trout Worms, and beads (try local Great Lakes Steelhead Co’s). This is the greatest skinnywater steelhead bite of the year but it won’t last long, probably another week, maybe 10 days. Then the cricks’ll drop to normal, driving the fish out; and flow after heavy rains, bringing in one or two until about mid-April. If the creeks are down when you get here, don’t despair. The Salmon River is swarming with so many steelies, in spots its floor looks like it’s chrome plated. It’ll remain that way until the middle of May.